Huge Clearance starts right now at Crazy 8 stores in the U.S. and online. 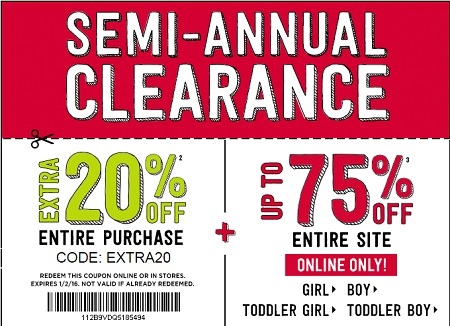 Plus, you can save even more when you use a special printable sale coupon. Print the coupon, bring it to your nearest Crazy 8 store and take an extra 20% off your purchase (online use promo code EXTRA20). Coupon is available through Crazy 8 emailing. Source of the information is Crazy 8. Offer expires 01/02/2016. More details available at your nearest store.